Google Earth is not only useful for sightseeing and looking at your house. For some time this blog has reported on serious business applications of Google Earth (see the business category for examples). Brian Timoney of Timoney Group provides professional services helping companies use Google Earth for visualization oriented applications. I wrote about an example he did for Jonah Gas. Now Brian has combined his efforts with another company called Eicher GIS (which specializes in ESRI GIS software and data) to produce an excellent visualization showing international trade between countries in South America. To see this example simply download this GE file . Contained in the Places folder will be instructions and background information. But, all you need to do is maybe turn off layers and placemarks not related to reduce clutter. 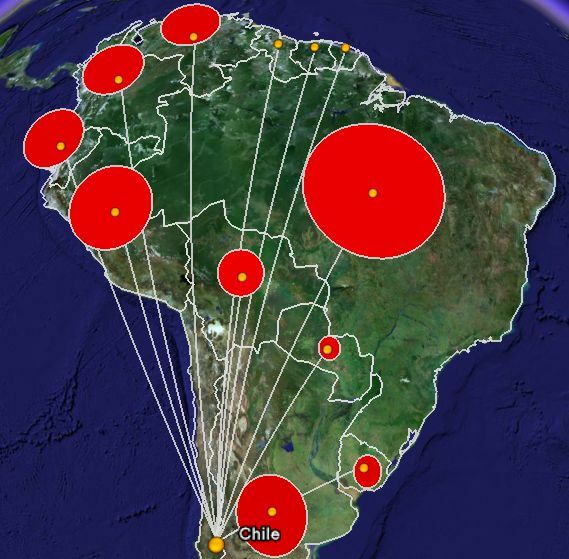 Then move your mouse over the gold icons hovering over each South American country. 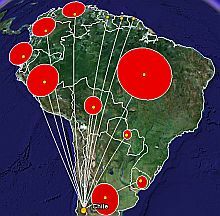 You will instantly see red circles representing the amount of trade exported to other South Amercian countries based on data from the United Nations COMTRADE database. If you click on the gold icons you will get a breakdown of the trade which you can further drill down to and see the numbers. You can read more details within the Places folders, or here is the web page describing the example in more detail. This is only the tip of the iceberg of business applications in Google Earth. Now that GE is out of beta, we should begin seeing many more businesses taking note of the powerful combination of global visualization with a large and growing user base bolstered by the top brand in the world (Google). Via OgleEarth.